Dawn Brolin is a CPA and Certified Fraud Examiner, based in Connecticut. 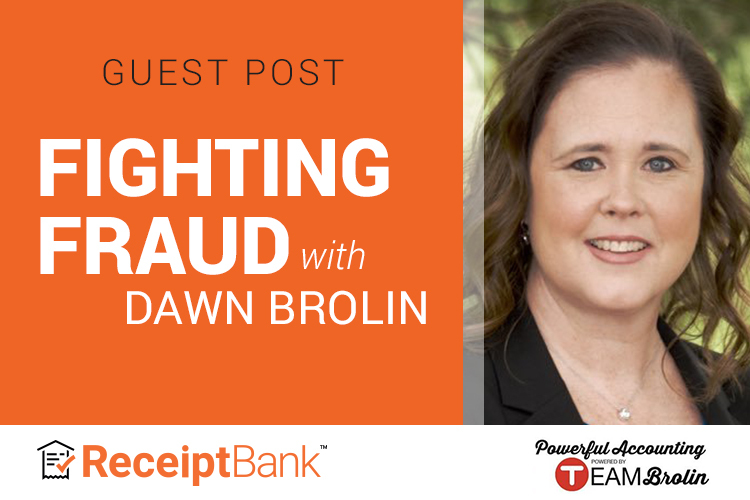 As the CEO of Powerful Accounting LLC and Fight Against Fraud, Dawn knows a thing or two about preventing fraud. The high level of service she offers helps to minimize the risks of fraud, with very little added effort from the client themself. Dawn has built a community of accountants dedicated to fighting fraud at fightagainstfraud.com where members can join for free to keep up with the most current information, including The Weekly Fraudcast. Fraud is more common than you think and it’s small regular incidents of fraud that add up over time. Yet it’s so easy to guard against - we talk with Dawn about practical steps accountants can take with their clients to keep them protected. The bonus is that your clients will love you for it, knowing that you have their back. Hear from Dawn below and join our Facebook live conversation with Dawn and Receipt Bank's own Damien Greathead on Friday, January 18th at 1pm EST. A couple weeks ago, I wrote an article for AccountingWeb about the prevalence of expense reimbursement fraud and how I use Receipt Bank with my clients to prevent it. What came out from the comments and feedback was that people have a lot of misconceptions about fraud, and how to prevent it. So today let’s dive a little deeper into what fraud might look like for your clients and discuss how you can use Receipt Bank to stop it in its tracks. Expense reimbursement fraud accounts for 21% of fraud in small businesses according to the Association of Certified Fraud Examiner’s 2018 Report to the Nations. While $25, $50, and $75 fraudulent reimbursements may seem trivial, these small amounts can add up very quickly. In fact, the median loss is $31,000. What if you could be the accountant, or better yet the trusted business advisor, who successfully prevents it before it even starts? Reimbursement fraud schemes can range from a few hundred dollars over the last few weeks to millions in a scheme that spans years. You can see from these examples just how easy it is for fraud to occur. Fortunately, these schemes are also fairly easy to uncover, especially for forensic accountants. However, you don’t have to be a forensic accountant to spot fraud in your client’s business. There are several steps that small businesses can take to fight fraud, and as their accountant, you should be prepared to guide them. In the US, the IRS only requires receipts for business expenses over $75. For tax deduction purposes, a bank statement is sufficient for all expenses under $75 and so some business owners don’t require a receipt at all for reimbursements on expenses under $75. This exposes business owners to unnecessary risk. A bank statement is not sufficient when it comes to preventing expense reimbursement fraud within your clients’ businesses. Why? Because bank statements simply don’t have the detail required to detect it. If an employee goes to Staples, for instance, how can your client know exactly what was purchased without an itemized receipt? Without knowing the purpose of the expenditure, how can your client know if there is any fraud in play? To give my clients a cost-effective solution, I recommend Receipt Bank in order to implement internal control within a business. This makes your service infinitely more valuable to them when compared to a potential $31,000 risk. This added value also gives you the power to set your own price for the services you offer. First things first, every business should have a company spending policy, signed off on by each employee. This details what is considered a qualified business expense and how to submit items for reimbursements. As the accountant, you should review your clients’ company spending policies on an annual basis. With changes to tax law, the business owner always needs to remain compliant and they are depending on you to provide guidance. Personally, I recommend that business owners should require original receipts for ALL reimbursable expenses, not just those over $75. Ideally the receipt should detail the items purchased, the date and the business name. When an employee submits a receipt for reimbursement through Receipt Bank, an image of the receipt is stored securely on the cloud, giving business owners (and yourself), visibility into the details of every single receipt. Now, your client can monitor receipts submitted by employees as they come in, and search through the archive for old receipts at anytime, from anywhere. What’s more, an archive of receipts means that business expenditures, such as expense reimbursement, on a tax return are substantiated. This minimizes the risk of tax fraud. At the end of the day it’s important to remember that your clients are experts in their field, and probably not in accounting or detecting fraud. By implementing internal controls, you give them the peace of mind to focus simply on running their business, knowing that you have their back. TO SEE HOW ELSE RECEIPT BANK CAN HELP YOUR CLIENTS, SCHEDULE A 1:1 DEMO WITH ONE OF OUR EXPERTS TODAY!